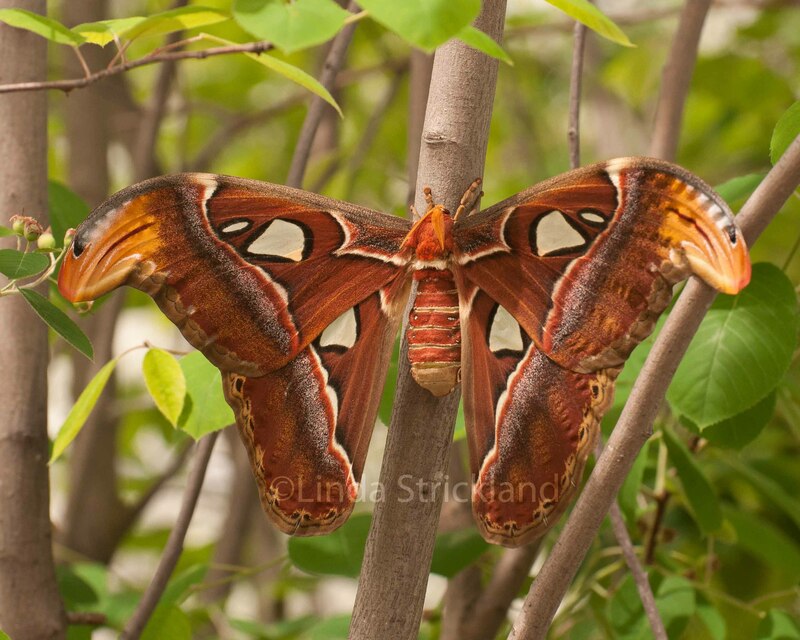 The atlas moth pictured above was in its first day of life when I discovered it. A truly amazing creature! I learned that it only lives for 2 weeks in its fully developed form. It doesn’t even have a mouth, so it can’t eat. As caterpillars they eat a lot, and this enables them to live off of their fat reserves as adults. The short adult life is only to be used to mate and lay eggs. They die shortly thereafter. Flying: The female doesn’t stray far from its discarded chrysalis. It attracts the male by secreting pheromones. The males are unsteady fliers, but can detect a female from many kilometers away. Fear: Every animal has a defense mechanism. On the uppermost part of the each atlas wing, there is an image of a snake. And the hair on their body is an irritant to the skin of other animals. They are preyed upon by other creatures as caterpillars. So, it is amazing to see them in all their adult glory. Their wingspans can reach up to 12 inches, and with badass snake wings, they must be glorious in flight! As you travel across this earth. May you just have a moment of freedom. Where do you go to catch all these beauties, Linda? Another wonderful picture! Thank you all for your comments. It was truly a miracle to see this moth and watch butterflies coming out of their chryalises. an amazing, miraculous day. Linda, what a magnificent picture and poem! It looks like a flower with wings. Thank you Wendy! It really inspired me. I’ve never seen anything quite like it before.